Forget the high rises with elevators and extended hallways. 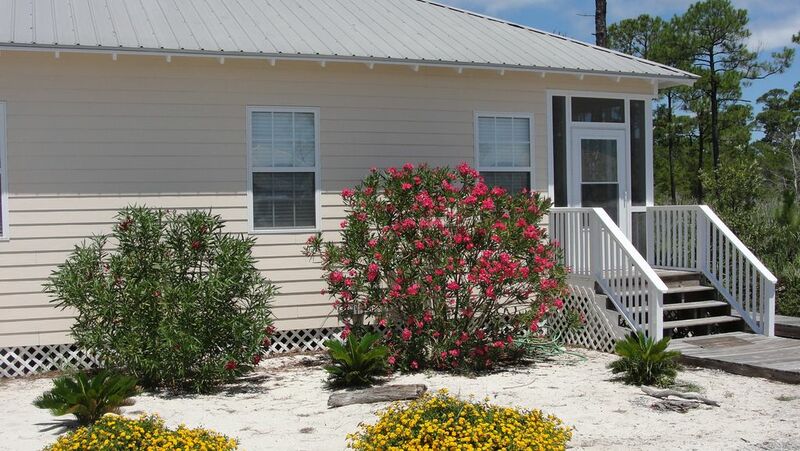 Enhance your vacation and capture the perfect blend of nature and relaxation at the Rookery -- a small community of single/duplex cottages nestled in the Bon Secour National Wildlife Refuge – 15 miles west of Gulf Shores at the 6 mile marker on Fort Morgan Road. Park right by your cottage for easy, convenient access to your front door. Enjoy the on-site amenities: two saltwater pools ( the large pool has a zero entry for the little ones); a hot tub for the adults; a tennis court and a family grilling area. Or head to the white, sandy beach (0.4 miles) across the street and watch the dolphins swim. You can then relax and enjoy the sounds of nature on your screened-in front porch. If you're a web surfer the cottage has broadband internet access for your convenience. This is a no smoking cottage. (7) guests and is bright, cheerful and fully furnished. Satellite HDTV with DVD, full size washer and dryer. The master bedroom has a king size bed. The guest bedroom has a queen size bed. And the third bedroom has a full size bed with a pull-out single size trundle underneath. There is ample parking for a boat. The marina is only 4 miles away. We do not rent to groups under 25 years of age. Three championship golf courses are located nearby: Kiva Dunes (2 miles), Peninsula (10 miles) and the Gulf Shores Golf Club (14 miles). 1/4 mile to the prettiest white sand beach anywhere. Resort Amenities Convenient parking (including boat/trailer parking), zero entry pool, hot tub/spa, tennis court, charcoal grills, nature trails, beach access (0.4 miles) Large outdoor pool has a heater/cooler which maintains a comfortable swimming temperature spring, summer and fall. . Hot tub heated year round. Cottage Amenities Fully furnished, sleeps 8 (king, queen, two twins and queen sleeper/sofa), three tv's (one HDTV), DVD player, ironing board & iron, blender, electric mixer, coffee pot, dishes/utensils (service for eight), hair dryer, towels/linens, full size washer and dryer, dishwasher, refrigerator w/icemaker, pots and pans (including lobster pot), alarm clock/radio. Everything was as expected. The property has everything we needed and more. I would recommend to friends and family. The cottage was perfectly appointed for our needs, and such a comfortable place to relax after the beach. We spent our days at Our beach (Our Rd) and it was so peaceful and so far from overcrowded! The owner was very responsive throughout the process, especially kind to mail an item to us that was left behind. I will definitely check to see if this cottage is available next year when we head back to Ft Morgan! A family reunion between two families who adopted from the same orphanage... perfect price, close enough to beach and cozy enough to visit with friends. Enjoyed the cottage and location. It was a .6 mile walk to beach but good for walking. Some got in truck to carry stuff to the beach. Some rode and some walked. The cottage is right across from pool. Kids go to ocean of morning and pool when it got real hot. Plenty of beach towels at cottage no need to bring your own. Even an umbrella sand buckets couple of chairs. The beds were very comfortable and cottage well furnished. Will absolutely check this out if ever come this way again. The owner is also sending me a bathing suit left behind. Can’t ask for more than that. Great place and a great trip! Perfect place with lots of room for us all. The pool was so big and children friendly. The Bon Secour Wildlife Refuge borders the cottage. Explore any of three marked Bon Secour trails (all within a ten minute drive). Visit historic Fort Morgan, six miles away at the end of the island. Take the ferry to Dauphin Island and visit Fort Gaines or the Sea Lab Estuary. Three championship golf courses are located nearby: Kiva Dunes (2 miles), Peninsula (10 miles) and Gulf Shores Golf Club (14 miles). Bargain hunt at the Tanger Outlet in Foley, Alabama. A short fifteen minute drive into Gulf Shores and you can visit Waterville, the Gulf Coast Zoo, or the “Track” (offering amusement park rides and arcade games). Numerous local restaurants also await you.